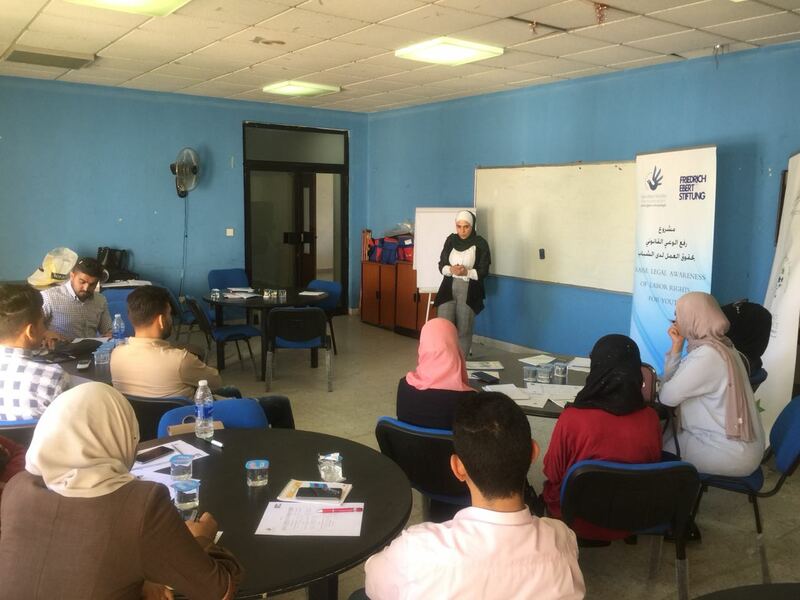 Amman - The Euro-Mediterranean Human Rights Monitor and the Friedrich Ebert Foundation organized a training workshop to students of law at the Jordanian University of Amman, to raise awareness among Jordanian youth of their labor rights. The workshop comes as part of a joint project implemented by the two organizations to provide legal awareness to Jordanian youth about labor legislation in Jordan, familiarize them with international conventions on workers' rights, and highlight the mechanisms available to young people working in various fields to ensure employers’ respect for labor rights. The project, which is implemented in cooperation with six public and private universities in different governorates of Jordan, aims at raising awareness on the legislation regulating individual private work and how the Jordanian youth can establish their own companies, with careful examination of the needed legal and practical steps towards this goal. Through this project, Euro-Med Monitor and the Friedrich Ebert Foundation aim to provide young people with full knowledge of their legal rights and their integration into the labor market, including raising awareness with regards to variations in the different legal structures as well as the rights and obligations resulting from each of these structures.